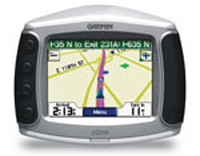 Garmin zūmo 550 (010-00567-01) €0.00 - buy online at mysatnav.ie - Ireland's leading GPS & Sat Nav store. The zūmo is both water and fuel resistant. It contains a trip odometer and fuel guage. It comes with a full motorcycle RAM mounting kit and power cables, security screw - everything you need for the bike and there is also a separate automotive mounting kit with an integrated speaker for use in your car. . The Garmin zūmo 550 comes preloaded with the latest Mapsource City Navigator NT Europe street-level maps for Ireland, the UK and Europe. Includes automatic re-routing, clear voice prompts, 2D and 3D map perspective, a glove-friendly touch screen with left-handed controls makes it easy to operate, an extensive points of interest database with the ability to add your own POI files. The zūmo makes active use of Bluetooth - you can pair the device with both your bluetooth-enabled helmet and your mobile phone so that you can listen to navigation instructions and MP3s from the zumo and also make and receive hands-free mobile phone calls wirelessly. You can even make phone calls to points of interest through the zumo�s Bluetooth interface. There is also an audio out socket for those who want to connect the GPS through the motorbike's Autocomm.